Last chance to save with our online-only Warehouse Sale. It's all over at midnight tomorrow, March 31. Until then you can save 10% on everything in the online store when you enter the coupon code MARCHDEAL during checkout. Don't miss this opportunity for savings on all your favorites, including Organic Everyday Green, Monkey-Picked Tie Guan Yin, Imperial Jasmine Pearls, and Yi Xing teapots, or get ready for the spring green tea season with a Standard White Gaiwan or Programmable Digital Electric Kettle. The discount is only valid online. Shop today! The latest issue of Kyoto Journal, all about tea, that we mentioned last month is now available at our teahouses and in our online store. In one of over a dozen tea-related articles, Imperial Tea Court Teamaster Roy Fong is interviewed about puerh. He recalls, "When I was little, drinking aged puerh tea was a matter of course. Good aged puerhs were abundant and affordable, so whether you were in a restaurant or at home, puerh tea was served." Tea, teaware, and tea culture are all discussed in this 96-page periodical that will intrigue any tea lover. 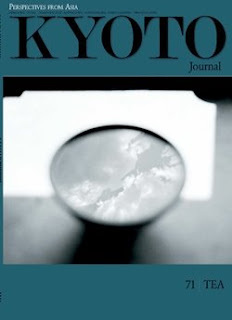 You can preview the issue at the Kyoto Journal web site. The other day I met Roy at the teahouse and once again he reached into his computer bag and pulled out a cake of the astounding Imperial Tribute Harvest Purple Tip Pu Er, by now looking a bit nibbled around the edges (I'm starting to wonder if he takes this cake with him everywhere--ah the perks of being a teamaster!). He invited me to join him for a few cups, an offer that of course I couldn't refuse. Interestingly, the cake is already starting to evolve. The first time I tasted it a couple of months ago the fruit flavor was so intense it was almost like drinking juice. All the fruit is still there, but it's becoming more concentrated and subdued, similar to how a grape turns into a raisin. Like before, we brewed the leaves three or four times and the tea didn't lose flavor. While we were talking it cooled to room temperature in our cups, but the tea remained just as delicious as when it was hot. In fact, the cool tea was incredibly crisp and refreshing, something that would taste fantastic on a hot summer afternoon. Roy said it would make the world's greatest iced tea! Roy compares pu er to a living being: unique, temperamental, always changing. It's fascinating to watch (taste) this young tea grow up. I'm going to make it a point to bump into Roy more often...and always check that computer bag! Earlier this week I was reading a thread on a popular foodie web site. Folks were looking for authentic Chinese-style hand-pulled noodles and arguing about their favorite restaurants--whether the noodles were actually hand-pulled and if so, whether they were really made fresh or batch-made in advance. Hand-pulled noodle fans in the Bay Area, rest assured: you can find the real deal in our Berkeley teahouse. You're welcome to watch our cooks hand-pull your order in our open kitchen while you wait. If they're done right, freshly hand-pulled noodles have a delicious chewy texture and the pleasing irregularity of a hand-crafted product. In addition to tea, Imperial Tea Court Teamaster Roy Fong loves a great hand-pulled noodle, so we make ours with Giusto organic flour and the special filtered water we use in our teahouses. You can order a bowl on its own or with a variety of other dishes and toppings on the menu. For the perfect combination, add a pot of Imperial Pu Er. Our hand-pulled noodles are only available in the Berkeley location. After reading about hand-pulled noodles for awhile my mouth was watering, so I headed to Berkeley for a big bowl. In the picture above you can see Ivy pulling the noodles for my order! Long a favorite in our teahouses, our hot and spicy Imperial Chili Sauce is now available for your home kitchen! Made with organic tea seed oil, spices, and plenty of fiery chili peppers, according to a traditional Chinese formula, it will enliven any dish, from plain noodles to steamed vegetables to potroast. Sure to delight anyone who enjoys the delicious fire of chilis. Sold in 120 ml (4 oz.) jars, available in our teahouses or from our web site. Spicy Beef Noodles is one of our most popular menu items. I make it with an authentic Sichuan-style spicy oil sauce that I learned when I lived in Chongqing. It's different from what other places call beef noodles. If you like spicy, Sichuan-style food you should try it! This teapot is made from high-quality purple sand clay, high-fired. It makes a good sound when you rub the top on the rim. It pours smoothly and when you hold it, it feels comfortable and balanced. I like the design, with an inscribed poem and plum blossoms, and the flat top and round body. It's a good size for four people. You can use it for either pu er or oolong tea. We just released the latest edition of our newsletter, Tea Readings. It's full of the latest news, information, and photos from Imperial Tea Court and the world of tea. Have a look and be sure to subscribe so you won't miss a single issue, delivered into your inbox. Oolong is my favorite tea to drink every day. I like our Imperial Wu Yi Yan Cha because I like strong tea. Yan Cha, from Fujian Province, is good with spicy food or strong flavors. When I can, I prefer to brew it in an yi xing teapot, rather than a gaiwan, for the most flavor. I like these cakes because they're just starting to change color, they have some age on them now. They have a nice peachy, plum-like flavor and you can brew them many times. I also like the way they're pressed, the old fashioned way, with stones, not machine-pressed. Because they're not pressed too tightly air can circulate and they'll age well. And these cakes are made with lots of tips. Wild 2003 cakes, not too expensive. How could they not be my favorites? Anticipating large shipments of new 2009 tea arriving over the next several months we need to make room in our warehouse, so we're having a special event in our online store, a Warehouse Sale! Only through March 31, and only online, if you enter the coupon code MARCHDEAL at checkout you'll receive a 10% discount on all purchases. This is a great chance to stock up on favorites or buy that yi xing teapot you've had your eye on. Sale is limited to quantities on hand, so shop early for the best selection. Note: the discount isn't available for purchases in our retail stores. Online only! PS: If you're in California another good reason to shop our sale this month is that state sales tax increases on April 1. No fooling! So far so good in Yunnan. The weather report is favorable. The harvest has started in some places and I have some exploratory orders for new green teas that I plan to introduce this year. The report from central China is also good, with production expected to increase. The temperature has reached 18 degrees C (64 degrees F) and the harvest is starting in the next week or so. Unfortunately, famous and rare teas are still in high demand so prices are expected to remain high. Eastern China has experienced an extended period of rain (almost 20 days) which may affect aromatics and flavor. Currently the weather is sunny with temperatures up to around 20 degrees C (68 degrees F). The harvest is expected to start around March 20. I will be there to oversee our Lotus Heart and Imperial Dragon Well harvest. The handmade, organic dim sum in our two restaurants has been receiving a lot of favorable press lately. If you love fresh, healthy Chinese home cooking be sure to visit either our Ferry Building teahouse in San Francisco, or our Berkeley location in Epicurious Garden (nice neighborhood--next door to Chez Panise). As a Hong Kong native, Imperial Tea Court Teamaster Roy Fong takes dim sum as seriously as he takes tea. Imperial Tea Court was the first purveyor of organic, handmade dim sum in San Francisco and is one of only a handful in the U.S. Our dim sum, handcrafted from the finest ingredients, is available all day, every day at both teahouses. Produce is sourced locally, as are many of the other ingredients. Our meat comes from Prather Ranch, a fellow Ferry Building Marketplace merchant known for its high quality. We order some of our noodles from Taiwan, while others are made to order in the Berkeley teahouse using organic flour from Giusto’s. All the cooking in our teahouses is done in organic tea seed oil, which we import from China. If you like this delicious, healthy oil, we also sell it. The Berkeley teahouse has a larger selection of dim sum thanks to its bigger kitchen. Most notably, in Berkeley we offer hand-pulled noodles, along with several varieties of made-to-order wontons, potstickers, dumplings, steamed buns, and green onion pancakes. If you have a bigger appetite the menu also includes soup, stir-fried dishes, and braises. At the Ferry Building teahouse the dim sum menu includes steamed buns filled with pork or greens; a variety of succulent dumplings and wontons; and handmade spring rolls that are baked, never fried. There's also an entree menu of homemade braised beef, pork, and curry tofu stews, as well as noodle dishes. Roy is working on a list of suggested teas for each dish. For example, he recommends Monkey-Picked Tie Guan Yin with our Teahouse Spicy Noodles, Imperial Jasmine Pearls with the Dim Sum Sampler, and Imperial Pu Er with our famous Beijing-style beef noodles. Our teahouses aren't just for tea! Stop by soon and try the dim sum for yourself. Just in Time for Green Tea Season: Our New Electric Kettle! Just in time for green tea season, when close water temperature control is important, we're pleased to offer a great new programmable digital electric kettle. Manufactured for us in China and UL-listed, with a capacity of approximately 1 liter, the 600-watt kettle allows you to set a desired temperature. The kettle heats water to the setpoint and maintains the temperature. Cordless with a corded base, it's available in either black or a dark teal-green. A terrific addition to any tea table, you'll wonder how you ever made tea without this handy accessory! Do you know bamboo charcoal? In Asia it’s renowned for its ability to remove impurities. It’s popular both as a fuel and as an additive to everything from food to toothpaste. Now one of our Taiwanese suppliers is making bamboo charcoal teaware. Imperial Tea Court Teamaster Roy Fong tried it and was so impressed with the taste of tea from this set that he decided to import some. Give it a try and see if you agree. We have two sets to choose from. Each includes a glazed ceramic teapot with matching cups; one is black, the other white. Each color has a different design; the white pot is somewhat larger than the black one. If you get a set leave a comment here on the blog with your impressions! This week we're going to start tweeting on Twitter; our Twitter ID is ImperialTea. We'll announce special events in the teahouses and provide live updates; share important tea news; provide links to interesting coverage; and generally keep you informed about the world of fine Chinese tea and teaware. We'll even tip you off when Roy's hanging out at the teahouse! So follow us on Twitter or subscribe to the RSS feed. We look forward to keeping in touch through this fun additional information channel. This weekend the San Francisco Chronicle asked famed chef and restauranteur Michael Mina to name some of his favorite hangouts in town. We were pleased that our Ferry Building teahouse made his list! Quoting Michael, "They have a great, calming space to take in a cup of tea." Stop by soon and relax while we handle the cooking and brew you a delicious cup of one of the world's finest Chinese teas. As green tea lovers are beginning to count the days until the 2009 harvest starts later this month, Imperial Tea Court Teamaster Roy Fong just passed along these weather forecasts that give a likely preview of coming attractions for the new tea season. Summing it up, he says, "it looks good so far." Yunnan: just starting to rain. Last year's weather was too wet and it affected the tea (too much moisture produces tea with low aromatics), so last year's Yunnan tea in general was not as good. This year's weather is a bit too dry, which will affect total yield and production, but if the weather pattern continues and maybe there's a bit more rainfall, we should enjoy good production. Also, the economic situation and the pu er tea "crash" mean more choices and farmers are ready to do better work in order to attract customers. We are in contact with our farmers and are expecting a good year from Yunnan. Our production is expected to start around March 15 or so. Hangzhou and Eastern China: raining with cold weather. This is good: rain nurtures the tea and the quality of the harvest should be good unless it gets excessively rainy. Last year there was a last-minute frost that was devastating to the harvest; it killed off the freshly sprouted leaves and caused both yield and quality issues. Barring the same conditions we hope to have a good dragonwell harvest again this year (we lucked out last year: while neighboring farms were devastated, we had a very good harvest of Lotus Heart, in fact, one of the best of the last few years). Good green tea yields from the Fujian and Eastern China area mean good base material for our jasmine teas. Fujian and oolong tea harvest starts in another 2-3 weeks and is not expected to reach full production until mid-April. Roy is leaving for China shortly to supervise the harvest and will be reporting more soon. We'll keep you posted!